Now we begin our travels within Alaska. We are using the entire map of Alaska to show our travels even though we know we will cover only a portion of the state. This is to make a point: we will have covered most of the highways in Alaska, but still only traveled a small portion of the state. Our first journey takes us to the small town of Chicken. A lot of people go to Chicken because it has such a strange name for a town. The story is that when it was named, the residents wanted to name it Ptarmigan, a local bird found in abundance in the area. However, no one could agree on the spelling of the word. Since the Ptarmigan is a chicken-like bird, they settled on Chicken. But we went to Chicken as a jumping off point for driving the Top of the World highway. This is a partially paved (about 30% we guess) road that runs from just north of Chicken to Dawson City, Yukon Territory, Canada. 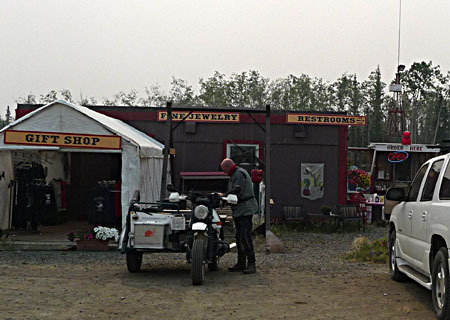 So we drove the truck and trailer to Chicken where we dry-camped while we made our journey to Dawson City. The town of Chicken is not large, but there is plenty of competition for the tourist dollar. Downtown Chicken has the Mercantile, Saloon, and Chicken Cafe. 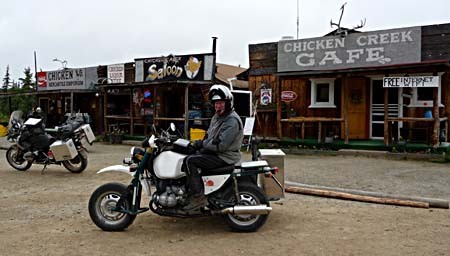 At left is a photo of Jim and the bike in front of downtown Chicken. There are 2 RV parks, each with a small shop and cafe, one of which sells fuel as well. One of these is named the Town of Chicken which tends to confuse visitors by directing them away from Downtown Chicken. There is also the Original Gold Camp RV park and cafe which has an old dredge from the 1950’s and offers gold panning. Each business tries to put up signs bigger than the others to direct traffic their way. This is probably very reminiscent of merchant behavior in the gold rush times. Even with all this, Chicken is a pretty quiet place. The drive to Chicken is not bad, about 67 miles, mostly paved. The last 2.5 miles are dirt and there were several sections on the way that were dirt or freshly graveled. There are many rough spots as well, requiring slower speeds for those who care about the longevity of their rig. Today we jumped on the sidecar and head down the dirt road that leads to the “Top of the World” highway. The first part of the road was quite rough and Jim deliberately proceeded slowly in order to get the feel of the road. Once we left the Taylor Highway and turned on to the “Top of the World” highway, it got marginally better. Jim kept the speed down to avoid any problems. We stopped for a rest break and met another cyclist heading to Dawson City. 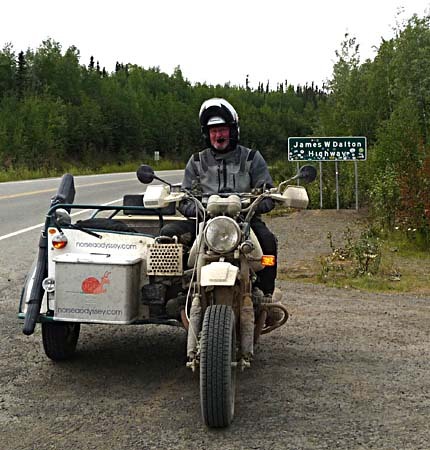 He was from Anchorage and was headed to the annual “Dust to Dawson” rally in Dawson City. He thought the road would improve once we got to the border. So we forged ahead, confident of better road ahead. Sure enough, once we passed the border, we were greeted by pavement! Wow! We sped along until the road turned to gravel again. But at least the gravel section was fairly smooth and we could make good time. The road continued to change from paved to gravel and back again. However, the views were certainly expansive. It truly does feel like you are on the top of the world. It brings a whole new definition to the phrase “vast expanse of wilderness.” The photo above shows a bit of the view as we look over one mountain to the next, and next. And, as you can see, the weather was beautiful! But our feeling of elation was soon deflated as we stopped for a rest break shortly before the downhill ride into Dawson City; a flat tire. Luckily, not totally flat, but not good. Jim pumped it full of air and it seemed to hold fairly well, so we continued on. Once in Dawson City we got enough pressure in the tire to find the hole, but the plug wasn’t sufficient. So off to the tire repair shop on the far side of town. They were able to plug and patch the tire, but found 2 holes, side by side. While they were fixing the tire, Jim put the spare tire (brand new) on the bike so we had more tread to cushion against sharp stones. 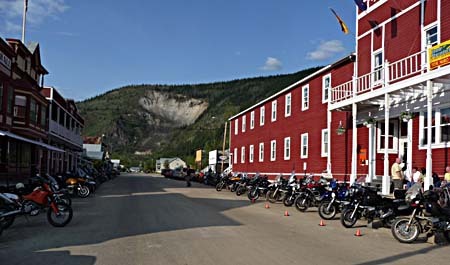 By this time, it was too late to make it back to the border crossing before it closed for the day, so we had to spend the night in Dawson City. We returned to downtown and were greeted by the site of all the bikes attending the rally (photo above). Luckily they had a room available, but we had no tooth brushes. We went to the general store and bought the LAST toothbrush in stock: a toddler’s brush for ages 2 to 4. It was small, but it worked. We woke today to overcast skies and a concern about incoming rain. So we quickly got up and dressed, got breakfast and gas, then hit the road. We were on the ferry at 8:15. We rode at a pretty good clip, happy to be ahead of most of the big motorhomes and their dust. By 9:40 we were across the border The road was defintiely better on the Canadian side, but we still kept up a good clip once on American soil. It hadn’t started raining yet, but was still threatening, so we didn’t want to slow down. We were still ahead of most of the traffic but shortly before Chicken we came up to 2 motorhomes flying down the road, throwing a huge cloud of dust. We were finally able to get by them, but were amazed at the speed they were driving over this rough road. We made it back to Chicken just as the first drops began to fall. We quickly cleaned our riding suits with the air compressor, then loaded the bike on the truck. By the time we finished the rain was coming down pretty well, so we packed up and left, hoping to drive the dirt portion of the road before it got too wet and slippery. It rained most of the night and was still coming down this morning. So we packed up and dried things up the best we could and hit the road. 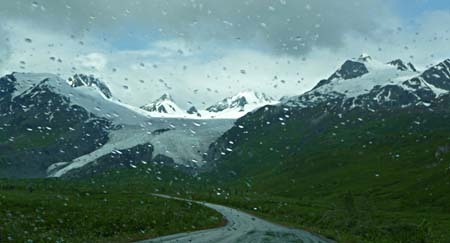 Today we headed south on the Tok cutoff road toward Valdez. It is about 260 miles to Valdez, so we expect to only do about half of that, depending on the quality of the road. The road began straight and relatively level. It was in decent condition, but soon began to degrade. The road had been patched where needed, but it had a wavy surface, creating what we call “whoop-dee-doos.” The rises and depressions are sufficiently deep to cause significant pitching. The only cure we know is to slow down. Later there were rough sections as well so we knew we would only make it half way. We arrived at Glennallen mid-afternoon and pulled into the RV park which was practically empty. But it was reasonable and handy and we parked. By early evening, the place had completely filled. We continued south today on our way to Valdez. The road began straight and flat but toward the end of the day it was quite hilly. At one point we hit an 8% downhill grade as we dropped quickly into a river valley. We can hardly wait to climb that grade on the way out. The last portion of the trip provided sweeping views of the coastal mountains and glaciers. By now it was also raining, but not too hard. The largest glacier we sited was the Worthington Glacier, shown in the photo at right. By the time we got to Valdez, we were out of the rain and there was a lot of blue sky overhead. Verna took the time to go for a bike ride around the bay to the pipeline terminal. There is a bike path the whole way and the scenery was marvelous. We saw several bald eagles and signs for bears, but no bears. The mountains around Valdez support some 13 glaciers, making for some stunning scenery. The photo at left shows not only the mountains, but also the lovely Alaskan Fireweed (in foreground) which is in bloom everywhere. The amazing part of the area is that the bay is surrounded by these huge mountains rising from the sea. It brought back fond memories of our time in Norway. We spent an additional 2 days here to unwind, complete some projects, and work on the web site. The initial RV park we selected had WiFi but we couldn’t get an IP address. So the next day we moved to another RV park that turned out to have great WiFi and was quieter as well. Monday Verna went on another bike ride, this time to the Valdez Glacier. Unfortunately, the clouds had dropped low and the glacier was visible only as it rose out of the lake below. However, Verna had the pleasure to meet Bruno and Annick from France who had bicycled here from Prudhoe Bay! That’s quite an accomplishment on a bicycle. From here they were taking the ferry to Skagway, then bicycling to Whitehorse, then south to British Columbia. Wow! This trip as well as their other adventures around the world are chronicled at www.roulmaloute.com. Of course it is in French, but Google does a decent job of translation, if desired. Photo below right is of Annick and Bruno as they were finishing their lunch. 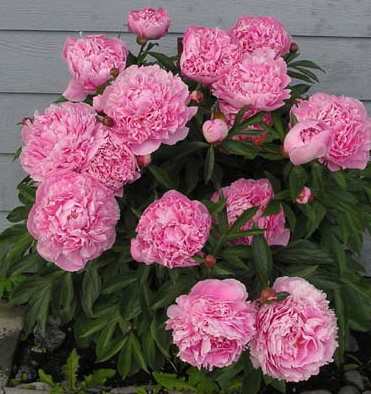 On one of our walks we found the peony plant (below left) blooming it’s heart out. Guess this is what 18 hours of sunlight a day will do for you! As we walked about town we enjoyed the fact that it is not very touristy. It was just a town with a harbor and lots of boats. We found good halibut and chips as well as salmon and chips in a local burger joint. And the harbor-side cafe had a great seafood chowder. However, our best find was Peter Pan Seafood, a commercial seafood venture that also has a market. Here we bought fresh salmon, frozen king crab, and frozen cod for very reasonable prices. So now the freezer is full and we have enough fresh salmon for several days. Today was a reverse of our trip down to Valdez, so no new roads today. Jim did talk with the Clay at American Tire in Fairbanks about our tires for the trailer and sidecar as they cannot get the Marathon tires we ordered due to a production problem in China. The salesman found another tire that should work for us, so we will try that. 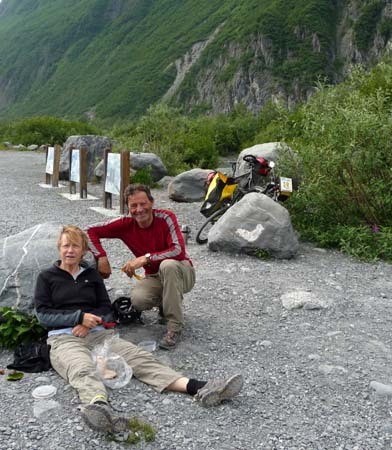 We also made contact with our friends Debbie and Pat Moore from Nashville, Tennessee who are in Alaska and have made arrangements to meet them in Seward after the 4th of July. We are looking forward to seeing them again. Just Just before arriving in Glennallen we passed the Wrangell-St. Elias National Park to the east. This is the largest of the National Parks as it is 6 times the size of Yellowstone. Four major mountain ranges converge here and they contain 9 of the 16 tallest peaks in the US. Only a small portion of the park is accessible by road and that requires a half day to get there (62 miles on a dirt road). We chose not to explore this area on this trip, but were provided a glimpse of it’s glory as we drove by. The photo above is of Mount Drum, a mere 12,010 feet. New scenery for us today was we head west toward Anchorage. It began relatively straight and level as we followed the river. Soon we began to see the mountains in the distance and we slowly began climbing. The photo below shows the view as we traveled west into the mountains. Several pullouts allowed us fantastic views of the Matanuska Glacier. After the glacier, the road narrowed as it twisted and turned through the low mountains. Gently the road began to descend as we neared Palmer. After that the road became a divided highway into Anchorage. We had decided on a campground in the town, right across the street from Costco as we needed to stock up on supplies. We walked over and bought as much fruit and veg as we could carry. Although the campground was full, the city was rather quiet for the 4th of July weekend. Verna enjoyed a long bike ride across town and down the coastal bikeway. There are lots of bike routes in Anchorage and the city publishes a map of them on their website (www.muni.org). We were conveniently located to do more shopping at the local grocery store, book store and Walmart. We enjoyed the time to relax and get some things done. Our vacuum cleaner died a few days ago so we also got a new one that hopefully will last longer than the last one. The drive south was mostly along the bay, but there wasn’t much of a view for the haze. There is a large forest fire north of Denali and the current high pressure system is holding in all the smoke. It got a bit better as got further south, but never cleared. All the way down there was a steady stream of traffic heading north and we were really glad we weren’t down there for the big weekend. We arrived in Seward and met up with our friends Pat & Debbie by early afternoon. They had arrived several hours earlier, but had just finished setting up as they had to wait for all the campers from the holiday leaving late! We finally got set up (it takes a lot longer when there are others around) and sat down for a late lunch. There were a couple of other Airstreams in the camp so of course we had lots of company as we all shared our experiences of Alaska. As we had a refrigerator full of food, we put together a good feast for dinner, but ended up eating about 9pm. With it staying light and so much to catch up on, the time got away from us. Monday Pat & Debbie went on a wildlife glacier cruise, so we “dogsat” with Georgia, their schnauzer. Verna took a long bicycle ride into town then down a long dirt road until she couldn’t go any farther, then returned. The city of Seward used the harbor side land for RV parking so there are a lot of camping spaces (mostly dry, but some with electricity). This land used to have canneries and other harbor businesses until the earthquake in 1964 when it was wiped out by the earthquake which caused fires, then washed away by the tsunami. We were staying a bit north of town in a private campground with all the amenities. Although we didn’t have the harbor side view, we did have a rushing creek and a local bear that liked to make daily visits, but never bothered anyone. Tuesday we relaxed most of the day, then visited the Exit Glacier in the late afternoon. We had decided that it was pretty nice here, so we extended for another 3 days. Wednesday Verna did the hill climb on her bike (saw 2 eagles), then we visited the Sealife center where you can see the local fish and seabirds up close and personal. The puffins are quite comical and fun to watch up close, but Verna could never get a picture of them as they were quite frenetic. 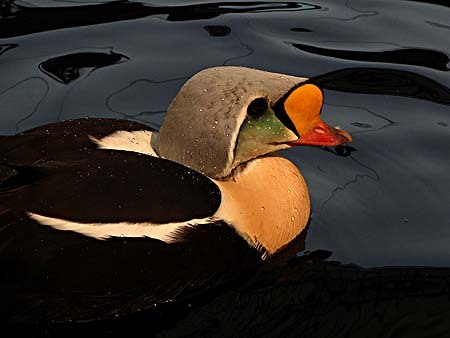 Instead, she captured a shot of this King Eider duck (above) who was much more sedate. They also had a wonderful display of the underwater world with tanks full of native fish (all well identified with photos along side the tank) and other sea life. 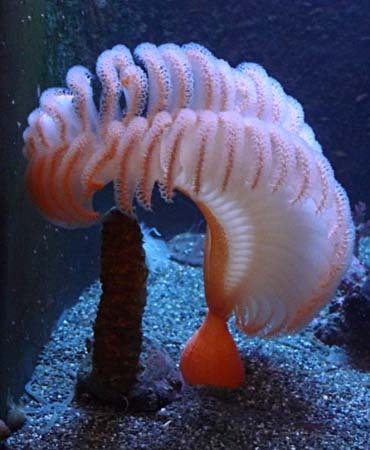 Verna was particularly taken with the Sea Pen which looks much like a pen quill (photo at right). Thursday we went on the wildlife glacier cruise and found it very interesting. We saw sea lions, sea otters, millions of sea birds, 5 whales, several Dall’s porpoises playing in the bow wake, and when we finally got to the glacier, the captain got as close as he could, then turned off the engines and told everyone to be quiet so we could hear the ice crack and move. For 20 minutes there was no noise other than the ice and the birds. Some fairly large chunks of ice calved off and the sound was like thunder. On the way back we spotted a black bear grazing the on the hillside and visited the rookeries of the sea birds. All in all a very good day. And the weather cooperated by staying in the low 70’s with relatively clear skies but there was still some smoke haze from the fires near Denali. Above is a photo of the Aialik Glacier as it meets the sea in Aialik Bay. It is quite a large glacier yet a small portion of the Harding Ice Field which contains almost 700 square miles of ice up to a mile thick. The ice field is the heart of the Kenai Fjords National Park. We left our friends today as we headed to points south and they to points east. It was wonderful to see them again and we truly enjoyed our time together. We are hoping we might see them once again in Alaska, but if not, we’ll meet up again somewhere else down the road. The first part of the ride was a reverse of the last leg coming here, then we turned west at Tern Lake Junction. The drive to Soldotna is fairly flat and straight heading due west. Much of it is along the Kenai River where there is much activity due to the salmon run. At the point where the Kenai River meets the Russian River there are quite a lot of fishermen. This area is known for “combat fishing” as it gets quite crowded at times. Today was a relatively quiet day. At Soldotna, the road veers southwest as we got near the coast, then we drove south to Anchor Point, the most westerly highway point in the US. From here we went east a ways to Homer. We were at the tip of the Kenai peninsula and at points you could see far out to sea (or at least as far as we can see with the smoke haze). Once in Homer we had a grand view of the Kachemak Bay and the Kenai Mountains across the bay. We expected cold weather here, but it was relatively warm. We began our town walk-about in long sleeves and soon shed them to just T-shirts. From the town you can see the Homer Spit where the harbor is, as well as hundreds of RVs. We chose to park in town away from “The Spit” in hopes of being away from the worst of the wind. While we did get some where we were, but, it was quite pleasant. We had heard that Homer was where the eagles were plentiful, but we didn’t see one! Above is a photo of the beach, across Kachemak Bay, and the mountains beyond. We woke to sun and blue skies again. We fully expected the weather to be colder and more overcast, but we are not complaining! 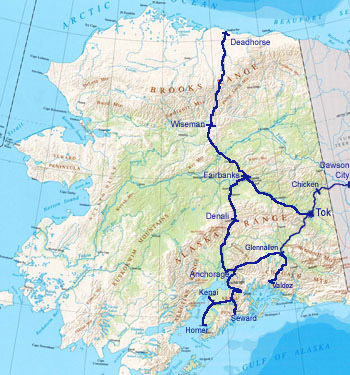 We reversed our tracks out of Homer until we got to Soldotna, then headed west to the coast. We saw 2 moose on the way. It was definitely cooler here and much more overcast. Temperatures were in the mid-60s so it was still pleasant, especially if you were out of the wind. Verna took off for a bicycle ride up the coast and on the way back stopped at an overlook to see the people fishing below. The sign at the overlook designated the areas for “Dip-netting”, so Verna asked a local what that was all about. We learned that yesterday the season for dip-netting began, which is why we saw so many people out there. And next weekend is supposed to be the peak, so it will be even more crowded. Residents of Alaska are allowed to dip-net in designated areas at particular times (non-residents are not even allowed to help the residents in any way). Regulations control the size of the net, but all shapes and sizes are seen. And patrols cruise the beach to keep everyone in line. Basically the person fishing stands thigh-to-waist deep in the water and rests the net frame upright in front of them (see photo, left). Then they wait for the fish to swim into it. As Verna was walking along the beach, someone was pulling in a red salmon every few minutes. Several people netted flounders, but they were generally released as they were deemed too much trouble to deal with. The campground we were in was located on the bluffs just above the mouth of the river which is where most of the “Dip-netting” activity was, so we got an opportunity to see a lot and talk with many folks about their “Dip-netting” experience. We were please to have been able to learn about this and see it firsthand. Today we head back to Anchorage as we retraced our path. We saw 1 moose on the journey. Another sunny day and much less smoke along the bay as we approached Anchorage. Below is a photo of the Anchorage skyline, as seen from the coastal bike path. Tuesday Verna took to the Anchorage bike trails again, this time trying 2 new paths with varying degrees of success. The first part of the first path began in a park and there were many side trails leading to surrounding residential areas. Unfortunately, none of these were marked, so many of them were explored before chancing upon the main route. Once found, it was a fairly straightforward ride west toward downtown as it followed Chester Creek. It was a much nicer ride than the city streets. The second path was at the south end of town and came back up to our camp. This one followed another creek and was nicely secluded from the busy city. At times you felt like you could have been in the wilderness if it weren’t for the faint buzz of traffic in the distance. But again, as the path entered park areas, the various divergent paths were not well marked and many dead-ends followed. It’s all part of the experience, right? But then she encountered the intersection of “Road Closed” and “Road Construction” - and there were no signs directing the rider where to go. Was just this intersection closed or was the road closed for miles? It made for a very long and frustrating day. Today we drove to Denali, “The Great One.” On the way, there are several pullouts that provide views of Denali, but nothing was visible due to the smoke and haze. We did get to see four Model T Fords that were traveling together. We stopped and talked with them for a long time. 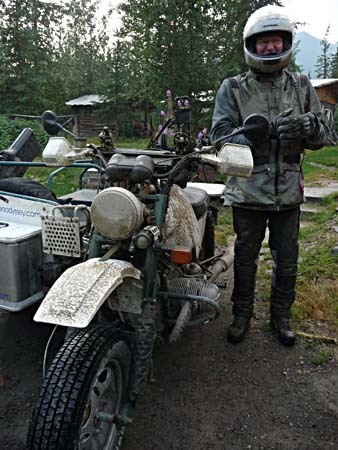 They were a mix of Alaskans and folks from the lower 48 states and were out for a jaunt from Anchorage to Paxton, across the Denali Highway (100 miles of dirt), then back to Anchorage. Considering they travel no more than 35 MPH that is a long trip. We got to Denali and the smoke was still present, then the rain began to fall. We had booked 3 days here and hoped it wouldn’t be a total waste. Thursday we woke to cloudy but dry skies so decided to take the drive out to Savage River, which is as far as you can travel in a private vehicle. Just before the river there is an area where you can see Denali on a clear day. Problem was, this wasn’t a clear day. 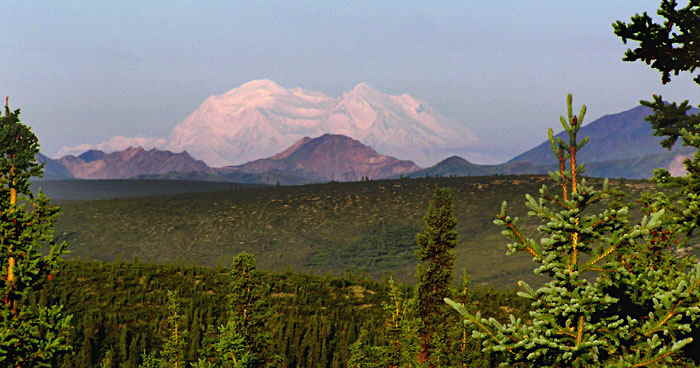 And even on clear days there is often a cloud surrounding Denali, cloaking its presence. According the the park brochure, the peak is visible only 20% of the time in the summer. We thought we were going to be in the 80% category! But it was a nice ride and we got a good sense of the Alaska Range from here. Verna went on a bicycle ride after we returned to the campground and saw a female moose and calf along side the road. We stayed at an RV park about a mile from the park entrance where the Denali Princess Hotel is located. In this area there is an abundance of small shops selling art, clothing, crafts, and providing flying, hiking and rafting adventures in the park. We wandered through the various shops but found nothing of interest. Friday Verna woke early (5:30) to sunny blue skies. Sensing this was the day, we quickly dressed and hopped in the truck and drove to the viewpoint we had gone to yesterday. Today we were reward with a view of the mountain! It is about 70 miles away from here, but it was clearly visible! We are now in the 20% category and consider ourselves very lucky. And, on the way back we saw 2 bull moose grazing in a stream bed in addition to the two females and one calf that we encountered on our way to the view point..
Later in the day we went to the dog kennels in the park where they maintain several sled dog teams for use in the park. 2 million of the 6 million acres of the park is a wilderness area and therefore no motorized vehicles are allowed. In the winter the only way to patrol these areas is by dogsled. Patrols range from several hours to 5 weeks as they drive thrit sled dog teams from cabin to cabin in the back country. Since the main purpose for the formation of the park was to protect the Dall Sheep and other wildlife, patrols are necessary year-round. It was a relatively short trip today as we headed out of the park and to the capital of the north, Fairbanks. As we left Denali, we cut through the canyon at right, cut by the Nenana River. The road began roughly but several miles further on it smoothed out and remained decent most of the way to Fairbanks. The drive was a gradual downhill slope as we drove north out of the Alaska Range. 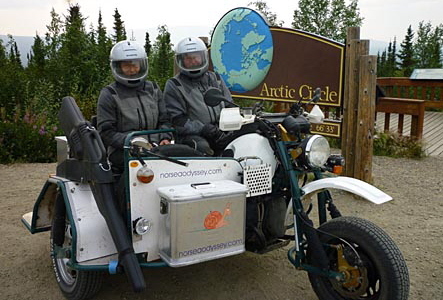 We will spend several days in Fairbanks as we prepare for our trip to Prudhoe Bay on the sidecar. On Sunday we talked with our friends Pat and Debbie Moore and learned they are coming up to Fairbanks to join us on our journey to Prudhoe Bay. Not only will this be more fun, it will also be safer for all of us. Our plan is to take two days each way to make the journey. Monday Jim got new tires for the sidecar so the bike is ready to go. Verna went for a bike ride and discovered the myriad ski trails near the university that are used as bike trails in the summer. It was a bit hot, so biking through the shaded woods was a pleasure. There was also a nice bike path on the outskirts of town so she got to view Fairbanks from all directions. Tuesday we continued our preparations for the trip north and relaxed a bit before the trip north. Pat and Debbie arrived mid-day after having gotten an extra spare tire for the trip. Wednesday we made all our arrangements (hotels), planned our meals and went shopping. We left Fairbanks around 9 am. Pat and Debbie went to find a McDonalds and we went to fuel up. 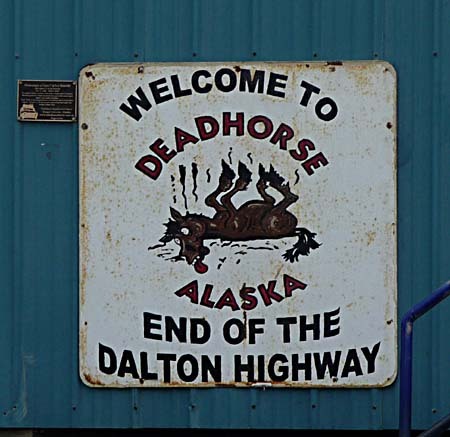 We met up in Livengood, about 70 miles north of Fairbanks where the pavement ends and the Dalton highway begins. Debbie and Verna picked some wild blueberries and raspberries, then we headed up the road. Soon after we were on the dirt road that is the Dalton Highway, a big tanker truck came flying past us, leaving us in a cloud of dust and flying rocks. This is their road; by law the trucks have the right of way. And yes, they do drive it as if they own it. We just slow down and moved over to stay out of their way the best we could. After about 20 miles we came to pavement that lasted about 10 miles. While the lack of dust was nice, it certainly wasn’t in the best of shape. The frost heaves cause it to buckle and crack and driving it is like driving a slalom course. Thankfully the weather was clear and relatively warm, so it was quite pleasant. Unfortunately, there were wildfires in the area so much of the the sky was hazy with smoke. About 1 pm we came to the Yukon River and soon after our lunch stop. As there are not many businesses along the route, you must plan carefully where you eat and fuel up. Our lunch was at the Hot Spot (photo, left), a small wayside that serves good (and big) burgers. Each couple shared one burger and then we hit the road again. Shortly after we traveld north from our lunch stop we encountered a paved road surface once again. It was paved all the way to Coldfoot. We crossed the imaginary line of the Arctic Circle shortly after lunch. Alongside the road there is a rest area with a map showing the Arctic Circle. The photo at right shows us at this point. This is actually the second time we have gone north of the Arctic Circle by vehicle; the first time was in Norway in 2003. For those questioning the large black box on Verna’s left we will tell you that this was our break down “insurance”; just in case we we had a problem and were stranded by the side of the road we wanted to be able to protect ourselves from wild animals. Fortunately this is not something that was needed. At this stop Pat and Debbie talked with a driver coming south who reported lots of people having flat tires just north of Coldfoot. The driver told them it was in a construction zone and he suspected that some metal was in the surface material. The afternoon ride was pleasant, although smoky. As we traveled north, the smoke increased. Lots of beautiful countryside and we were not able to fully appreciate the beauty due to the severe smoke. Several places we stopped for breaks but didn’t bother with photos. Late in the day we arrived at Coldfoot - the only place along the road to get fuel. We filled the tanks and moved on. Just another 16 miles to go to our stop for the night. We got out on the road and almost immediately it began to rain. And the road was no longer paved. Within minutes, Jim was covered with mud from our front tire. We had to stop to clean off his face shield so he could see to drive. By the time we got to the motel, Jim was soaked and Verna was just damp from the drizzle. At left is a photo of Jim and the bike at the end of the day. unfortunately the picture does not show how muddy the bike and Jim were! Looks like we should have stopped right away to put on the rain gear. After a hot shower, a glass of wine and a hot dinner, Jim was feeling a bit better. We enjoyed a nice relaxing evening together recounting the day’s events and looking forward to more tomorrow. We woke to overcast skies and threatening rain. We ate breakfast then packed up and headed out. This time with full rain gear! It rained lightly for awhile but was dry by the time we got to the Atigun Pass. It was still overcast, but dry. The road was in decent condition so we made good time. At the base of the steepest portion of the pass, we saw a large truck decending the pass. Pat pulled over to wait for him to pass as the hill was steep with a sharp curve at the bottom. We found that this was the best procedure when encountering these trucks. If we pulled over and slowed down, the truck drivers generally did the same. All in all, it seemed the safest method. After the pass, we were in the heart of the Brooks Range. The road proceeds through a long valley with the tall mountains looming above on either side. By now the air was a bit more clear as there were no forest fires. It was absolutely beautiful and seemed to go on forever. As we came out of this valley, we entered an area of huge rolling hills, totally free from trees. We were now so far north that trees cannot grow due to the intense cold of the winter. However, there is rampant growth of low brush. and mosquitos are plentiful! There was no wind and every time we tried to stop for lunch, we got absolutely swarmed by the mosquitoes. We did make a few stops for necessities, but finally decided to drive on through to Deadhorse without stopping; we were too dirty to get into Pat and Debbie’s car even though they were kind enough to make the offer. 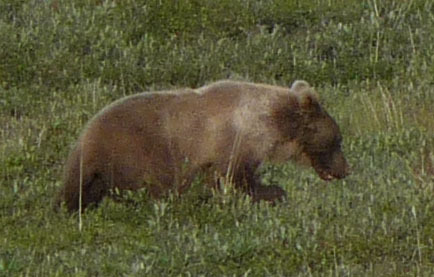 One stop we did make was when Pat and Debbie saw a Grizzly bear alongside the road. It ran off as they stopped, but they spotted another a ways off. Verna took the photo at right as it was heading off. They don’t seem to want any human encounters, which is just fine by us. By about 3:15 PM we arrived in Deadhorse, the end of the road for us. We checked into our hotel which was much nicer accommodations than the night before (also a lot more money). We had a quick bite to eat in the cafeteria (the room comes with full use of the cafeteria), then headed over to another hotel where we joined the organized tour of the oil fields. The tour included a video about the oil production and pipeline, then a bus ride to Prudhoe Bay. On the way, we saw lots of oil well heads, oil field equipment and pipes. 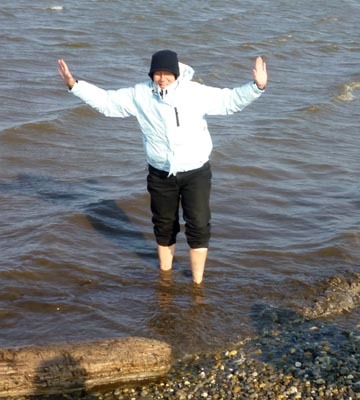 Once at the Arctic Ocean we were able to walk around and even enter the water if we desired. Verna had to do it, and here’s the photo to prove it (left). While the water was cold, it wasn’t as cold as she expected. However, she is dressed in several layers including a down jacket and wool knit cap! A bit overcast today as we prepared to leave. We all got a good night’s sleep and were ready for another day. We fueled up then went to the Napa Auto Parts for brake fluid, then headed out. As Verna waited for Jim to do his shopping, she noticed the sign on the store wall for Deadhorse (photo, left). We spotted several caribou just after leaving Deadhorse. A while later we also saw a Musk Ox along the river. Several large raptors were seen, although we weren’t sure what they were. While the road was the same one we came up yesterday, it seemed a bit different from this point of view. The weather cleared as we continued along, making for lovely views. At the first rest stop, we saw that Pat & Debbie had 3 huge rock-cracks in their windshield. Pat said it happened just as we were leaving Deadhorse; he hadn’t pulled over as it was hard packed dirt with no rocks. But the oncoming truck obviously had some rocks in his tires that went flying. It was the down-point of the trip. Coming south we had glorious views of the Brooks Range as we approached (photo, above). The mountains are impressive up close and we could barely see the distant glaciers. Today as we made our rest stops we usually had enough wind to keep the mosquitos at bay. But without any wind, they were ferocious. Even with repellent, the constant buzzing around was quite a nuisance. We either wore our helmets with the face shield closed, or we donned the fashionable head nets. We had an uneventful trip south to Wiseman where we were to spend the night again. Since it was still relatively early, we drove on to Coldfoot to fuel up for tomorrow and to visit the Arctic Visitor Center (which is why the return mileage is longer than going up). While at the fuel station, we met a young Japanese man on his bicycle on his way to Deadhorse. He had written on his panniers all the countries he has cycled in in the last 3 years and it was pretty impressive. When asked, he explained he would probably be in North America for a year, then head to South America. He has allowed himself another 2 years to travel before settling down. We returned to Wiseman for a dinner of hot soup and garlic bread (and reindeer salami and cheese for appetizers). We hoped for a good night’s sleep, but weren’t expecting too much.We got an early start with clear weather but wore our raingear anyway. It would at least keep the dust off us. Thankfully the smoke had dissipated a bit so we could see some of the scenery we were not able to appreciate on the way up. By the time we got to our lunch stop at the Hot Spot, it was getting warm so we put away the raingear. This time we tried their pulled pork sandwich which was equally as good as the hamburger. As we got to the end of the Dalton Highway, we stopped for a photo of the road sign (right) marking the beginning of the highway. We have done it. No flat tires, no major problems, just lots of dirt and calcium chloride to wash off everything. It was worth the effort and we are both glad we did it. We needed a bit of R&R and time to clean everything up after the trip north. Jim washed the bike about 3 times and got most of the stuff off. Verna went shopping for provisions for the next leg of our journey. The clothing was readied for washing, but we decided to wait for our next stop as there was no warm water at the laundry here. Pat and Debbie headed out on Wednesday, but we opted for another day to get things organized. Our first stop today was the tire shop where we got new tires all around on the trailer. We still had some tread left, but not enough to get us all they way back to the lower 48. Since we could not get the Marathon tires, we tried a new tire. As we headed south out of Fairbanks, the sky became thick with smoke. The smoke stayed with us for most of the way. As we came to the area near Moosehead Lake, Jim saw the head of a moose come out of the bushes by the side of the road. Then the large moose was on the road in front of us. Jim quickly braked and the moose kept moving, so a disaster was averted, but just barely. We couldn’t believe how quickly she seemed to come out of nowhere. We checked into the local RV park and spent the rest of the day doing laundry. If you find typographical errors or have any other problems when looking at the site please contact the Webmaster describing the problem and the page involved.